These unnatural diets often result in acidosis, inflammation and sickness. To remedy this situation, cows are then given a steady dose of antibiotics. Roughly 70% of the total United States antibiotic production is fed to our farm animals just to keep them alive. Shocking, isn't it? Research has revealed that these antibiotics are being transmitted to the consumer which may cause hormonal, reproductive and developmental issues. To add insult to injury, many conventional cows are also fed growth hormones and steroids to expedite their growth. These unnatural practices increase the “efficiency” of cattle farming by fattening the cows quickly. Grain-feeding cows only benefits the producer. Sound familiar? What’s more troubling is that many of the studies demonizing red meat were conducted using only grain-fed red meat. I have no doubt that the controversy surrounding red meat consumption would dissipate if these studies tested grass-fed red meat instead. Fortunately, comparative research has begun. These studies have revealed that grass-fed beef is a very different product than grain-fed beef. Not only is it nutritionally superior but it also allows you to avoid the antibiotics, steroids, GMOs (genetically modified organisms) growth hormones and other freaky chemicals used on conventional farms. In other words, eating grass-fed beef can be the difference between floundering and flourishing health. Need more proof? Here are my top 12 reasons get your hands on high quality, nutritionally superior grass-fed beef today! Omega-6 and omega-3 are essential fatty acids necessary for a number of bodily functions. They are considered “essential” because they cannot be produced by our bodies and therefore must be consumed in our diet. It has been estimated that approximately 40% of Americans consume adequate amounts of omega-3 fatty acids. A study conducted by Harvard University in 2009 also revealed that omega-3 deficiency is the #6 biggest killer for Americans. It is responsible for between 72,000-96,000 preventable deaths each year! Grass-fed and grain-fed beef contain comparable amounts of omega-6 fatty acids. However, current research suggests grass-fed beef contains 2-5 times more omega-3 fatty acids depending on the breed. This is important because omega-3 fatty acids reduce inflammation decreasing your risk for coronary artery disease, hypertension, heart attacks, arthritis, cancer (breast, prostate, colon) and other autoimmune and inflammatory conditions. They have also been documented to improve brain function and reduce the risk of depression, schizophrenia, attention deficit disorder with hyperactivity and Alzheimer’s disease. As I mentioned above, omega-6 and omega-3 fatty acids are polyunsaturated fats that must be obtained from our diet. While both fatty acids are essential for thriving health, they must be kept in balance. An excess of omega-6 fatty acids has been shown to negatively impact the metabolism and use of inflammation-reducing omega-3 fatty acids. Our ancestors consumed an optimal ratio of omega-6 to omega-3 fatty acids between 4-1:1. One study conducted in 2008 suggests that a typical Western diet results in a ratio closer to 30:1. This extreme imbalance has resulted in inflammation that increases the risk for cardiovascular disease, cancer and autoimmune conditions. Grass-fed beef, with a common omega-6 to omega-3 ratio of 1.53:1, will help to restore balance. Grain fed meat, with a less favorable ratio of 7.65:1, simply perpetuates the imbalance. 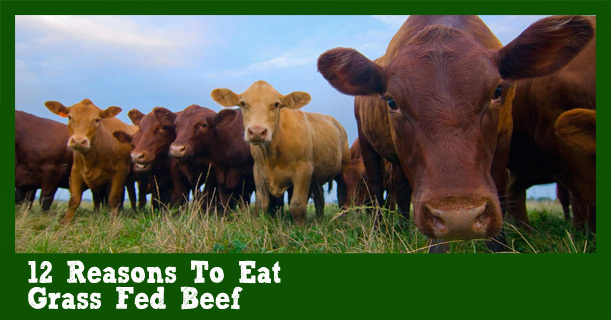 Therefore, consuming grass-fed beef may reduce your risk of several modern day diseases. Grass-fed beef is one of the best sources of conjugated linoleic acid (CLA). CLA is a polyunsaturated fatty acid found in the meat and dairy of animals, especially those fed green grass. It exerts potent antioxidant activity. Although grain fed beef also contains this fatty acid, grass-fed beef contains 2-3 times more! Animal studies have documented CLA’s ability to prevent diseases like cancer, diabetes and heart disease. CLA has also been found to reduce fat deposition. Finally, one human study noted that women with the highest levels of CLA in their diet had a 60% lower risk of breast cancer than women with the lowest levels. This means grass-fed beef provides far more disease-protective and fat-busting bang for your buck! Grass-fed beef contains important minerals that many Americans are deficient in today. A mineral-rich diet promotes healthy bones, skin, blood, muscles, nerves and metabolism. A side-by-side comparison conducted by the USDA and Clemson University determined that grass-fed beef contains more calcium, magnesium and potassium than grain-fed beef. Other studies have also found higher levels of zinc, phosphorus, sodium, and iron. Eating grass-fed beef is one way to restore mineral density in your diet. In that study conducted by Clemson University and the USDA it was also determined that grass-fed beef contains higher levels of the B vitamins thiamin and riboflavin than grain-fed counterparts. Both thiamin and riboflavin are important for energy production. In addition, riboflavin acts as an antioxidant and is important for red blood cell production. All B vitamins are also considered “anti-stress” vitamins. They help bolster the immune system and increase our ability to withstand stress. Thus, diets rich in B vitamins help reduce the chances of stress-induced diseases and disorders. Dr. Weston Price found that levels of fat-soluble vitamins (A, D, E and K) in cows were highest in the spring and fall. This is when they had access to rapidly growing green grass. Fat soluble vitamins enhance mineral and protein absorption and are believed to protect against cardiovascular disease. Grain-fed cows absorb lower amounts of fat soluble vitamins thus reducing the amount of these vitamins delivered to you. According to a study from California State University, meat from pasture-raised steers contained 7 times the concentration of beta-carotene as compared to that of grain-fed cattle. Beta carotene is an important precursor to vitamin A. This is vital for healthy skin, mucous membranes, immunity and vision. It is the elevated beta-carotene content that gives the fat in grass-fed beef a yellowish tinge indicating a more favorable fatty acid profile and higher antioxidant count. Research conducted by Colorado State University discovered that vitamin E was four times more abundant in grass-fed vs. grain-fed cattle. It was also more abundant than grain-fed cattle that received vitamin E supplementation. Vitamin E is an important antioxidant that has been found to protect against cardiovascular disease, cancer and other disease of aging. Approximately 92% of America men and 98% of women fail to consume the Dietary Reference Intake (DRI) for vitamin E. Sadly, most Americans consume only half the recommended amount (7.5 mg vs. 15 mg). Grass-fed beef is also higher in vaccenic acid, a naturally occurring trans fat. Man-made trans fats are incredibly dangerous and should never be consumed. However, naturally-occurring trans fats can actually be health supportive. In a trial published in 2005, vaccenic acid was shown to protect against atherosclerosis or the hardening of the arteries that can lead to cardiovascular disease. It is also a precursor to CLA the cancer-fighting and muscle promoting fatty acid discussed above. Glutathione is a powerful antioxidant that helps protect the body from oxidation and DNA damage. Although it is found in many foods, a study conducted by Descalzo et al. (2007) noted that grass-fed beef contains more glutathione than grain-fed products. This helps to protect the beef from oxidation. It also delivers higher antioxidant levels to the savvy consumer. 11. Toxins are stored in fat of grain-fed beef! Fat stores toxins. Because grain-fed cattle are fed antibiotics, steroids and hormones, their fat is far more likely to store them. Grass-fed cattle, by contrast, will be free of these freaky substances which means so are YOU. Grass-fed beef may be as important for mental health as it is for physical health. Dr. Felice Jacka, a pioneer in the study of the association between diet and mental health, found that grass-fed red meat appears to be more protective against anxiety and depression than any other food studied. Its effects remained even when other variables such as socioeconomic status, physical activity, smoking, weight and age were considered. Grass-fed beef is also a better source of tryptophan than grain-fed meats. Tryptophan, an essential amino acid, must be obtained from the diet. It serves as a precursor for serotonin, a neurotransmitter that guards against depression. So, while it may sound crazy, grass-fed meats can actually help keep you calm and happy. But wait! There is one final important consideration! WARNING: Not all grass-fed beef is created equal. Many producers will claim that their beef is grass-fed, even when they are fed grains for the latter portion of their lives. This practice is utilized because it fattens the cows quickly. Unfortunately, grain-feeding for even a few short weeks can diminish the nutrient concentration of the final product and reduce the benefits we have discussed. For best results always purchase 100% grass-fed beef. These cows will never, EVER be fed anything other than grass. 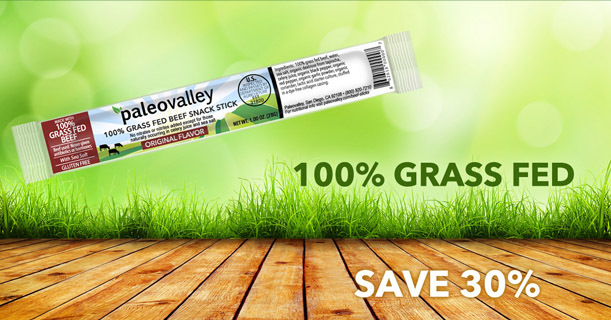 We use only 100% grass fed beef in Paleovalley's 100% Grass Fed Beef Snack Sticks. 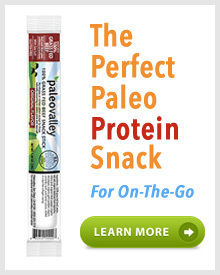 These beef sticks are a perfectly healthy, handcrafted, high protein snack for on-the-go. So instead of settling for health diminishing snacks and poor quality meats, grab some of these tasty little 100% Grass Fed Beef Sticks and you'll have a healthy option no matter where you are - whether at home, work, school, or on vacation. They are shelf stable using a completely natural fermentation preservation process so as to avoid the GMO ingredients commonly used in conventional methods. Always choose high quality, antioxidant rich, nutritionally superior, 100% grass-fed beef.